Call HD For Garland Foundation Repair. We’re Contractors The End Problems Using A Great Repair Process. For Garland foundation repair contractors, count on us. Our company utilizes a repair process that’s effective. Contact HD Foundations today. We guarantee our work and provide free estimates. HD stops structural foundation damage and ends foundation repair problems. Why Garland Foundation Repair Service? Structures in this area are prone to deterioration due to clay soils and variable climate. Structural foundation damage is a real issue. By enlisting contractors to perform the house foundation repair process, you can make sure your Garland house is upright and even. This includes concrete slab foundations and pier and beam houses. Sagging floors or wet crawl spaces are problems. If you see damage, call on us for crawl space repair. 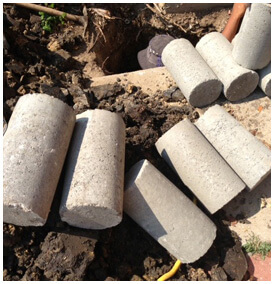 When we install pressed steel pilings or pressed concrete foundation piers, it stabilizes Garland structures. Having house leveling service preserves your property value. 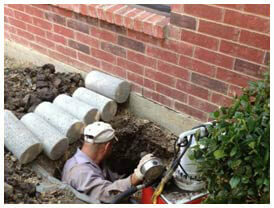 Residential foundation repair contractors in Garland prevents ongoing foundation damage. The contractors at HD Foundations in Garland offer an outstanding foundation repair warranty, Our company has an excellent Better Business Bureau rating and has served North Texas for years. We prevent foundation problems such as sloping and sinking. HD stops stop exterior brick cracks, uneven floors and foundation settlement. Our repairs prevent heaving. It’s a condition that often occurs in slab foundations and and pier and beam houses. We help you avert trouble by raising your house and making it even. 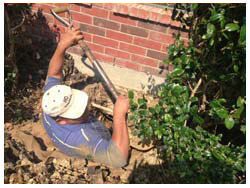 Underpinning is highly effective in preventing slab foundation cracks all throughout the Dallas, Fort Worth metroplex. Our contractor services stops wall cracks and crevices in ceilings and floors. It prevents your doors and window frames from becoming misaligned. By installing interior or exterior pressed foundation piers around or under your Garland structure, we stop foundation repair issues. If water is seeping under your foundation, we can prevent problems by installing drains or sump pumps. Find Out About Our Process. Get A Lifetime Foundation Warranty And Free Estimates. HD Foundations guarantees its service and provides a an outstanding warranty. If you’re a property owner, call on us to perform a foundation evaluation at no charge. If you need a contractor in or around Garland, foundation repair estimates can be scheduled free online today. We service houses, apartment buildings and townhouses all throughout the Dallas, Fort Worth metroplex.